A delegation of Nevada legislators and industry representatives at the Barbary Coast marijuana dispensary in San Francisco on Nov. 19, 2018. Photo by Michelle Rindels. Catching a whiff of marijuana is nothing unusual in San Francisco. But on Monday, a cadre of Nevada legislators was wide-eyed as they watched people pay to smoke openly in the counterculture capital of the world. 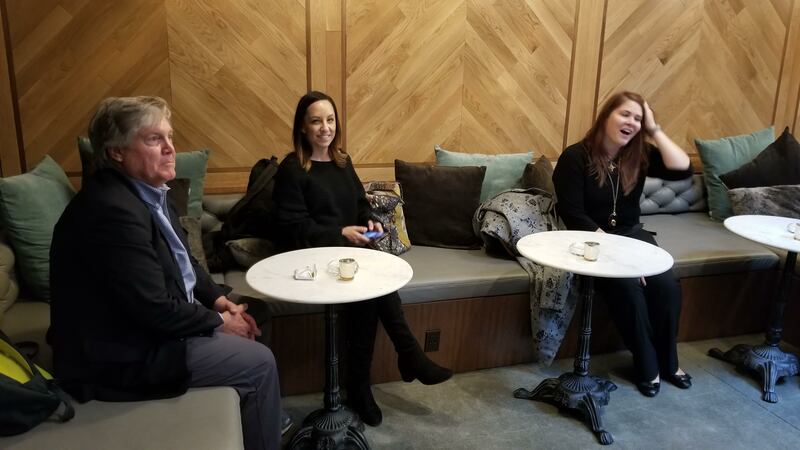 A handful of highly regulated lounges there are the first places in the country where public marijuana consumption is explicitly legal, and it’s a concept they hope to emulate in Nevada. A delegation of Nevada legislators and industry representatives at a “dab bar” at the Barbary Coast marijuana dispensary in San Francisco on Nov. 19, 2018. Photo by Michelle Rindels. Nevada voters legalized recreational marijuana sales in 2016, but the initiative bans public consumption, meaning a private home is essentially the only place people can legally use the products they buy. It’s an even bigger conundrum for tourists — hotels with gambling on the premises have given cannabis a clear cold shoulder, in part because of concerns raised by state gaming regulators. In spite of the legal restrictions, it appears police aren’t strictly enforcing the public consumption ban. KSNV reported that Las Vegas police issued 41 tickets for public marijuana use in the first year of legalization, compared with 762 citations by Denver police in the first year of legal cannabis there. Local governments in Nevada and the other nine states with legalized recreational marijuana sales and use have been hesitant to pull the trigger and allow consumption lounges that would offer people a place to freely and openly consume. In 2017, Gov. Brian Sandoval vetoed one of Segerblom’s bills explicitly allowing the lounges to operate. Segerblom requested and received an opinion from legislative lawyers that gave some legal cover to the concept, although local governments have been somewhat hesitant to adopt ordinances allowing for the businesses to begin operating in the year since legal recreational sales began. 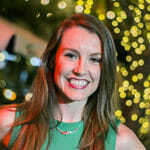 But some jurisdictions, including the City of Las Vegas, are in the process of drafting ordinances that would allow the consumption lounges to legally operate, and many dispensaries are reserving space for a future legal smoke site. Segerblom said he believes county staff are also developing language for such a rule. 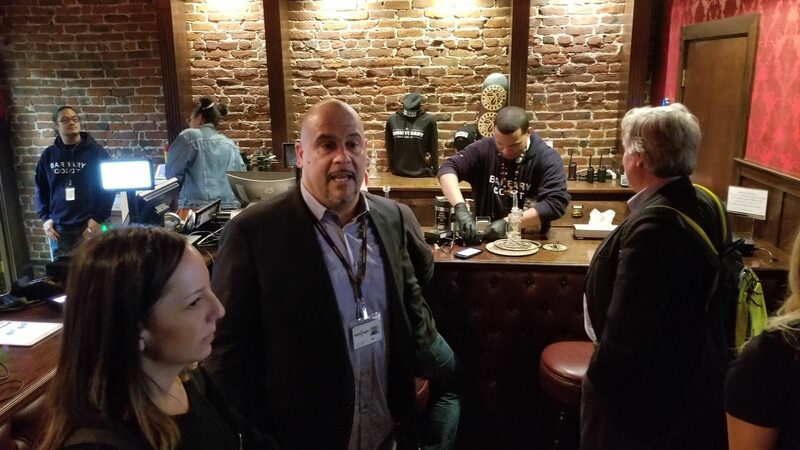 A delegation of Nevada legislators and industry representatives at the Harvest marijuana dispensary and consumption lounge in San Francisco on Nov. 19, 2018. Photo by Michelle Rindels. Two lounges that members of the Nevada delegation visited on Monday — both of which began serving non-medical marijuana customers in the last year — offer a glimpse of different forms that “social consumption” might take. Owners say a majority of the customers are tourists curious to try marijuana in the open. After showing their ID at a check-in desk, visitors can buy cannabis at a counter that feels much like a bar. Farther into the building is the lounge — a sophisticated ventilation system “walls off” the smoke from inside from other parts of the building and places where employees are stationed. 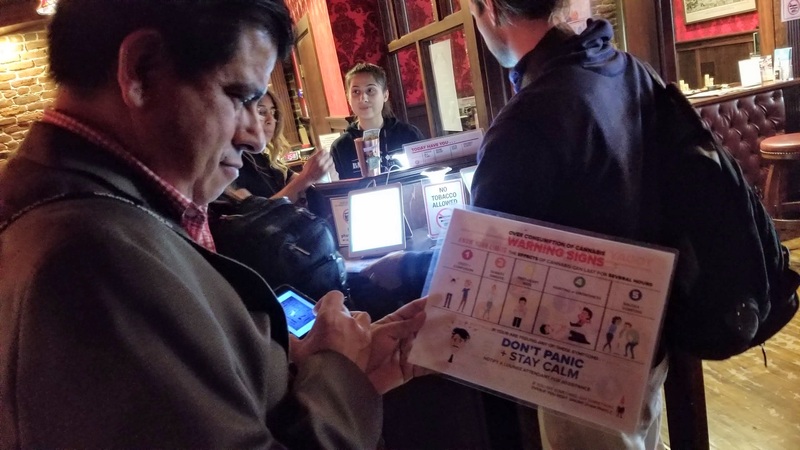 Visitors must sign a waiver before entering, and the lounge hands them restaurant-style buzzers to alert them when they’ve reached the maximum 30-minute allotment in the smoking room — a precaution against “over-intoxication” from second-hand smoke. They also hand the customer a laminated fact sheet when entering that advises them about the risks of consuming too much cannabis too quickly, and soon plan to have nurses on site to add more peace of mind. 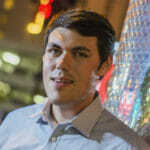 North Las Vegas City Councilman Isaac Barron at the Barbary Coast marijuana dispensary and consumption lounge in San Francisco on Nov. 19, 2018. Photo by Michelle Rindels. 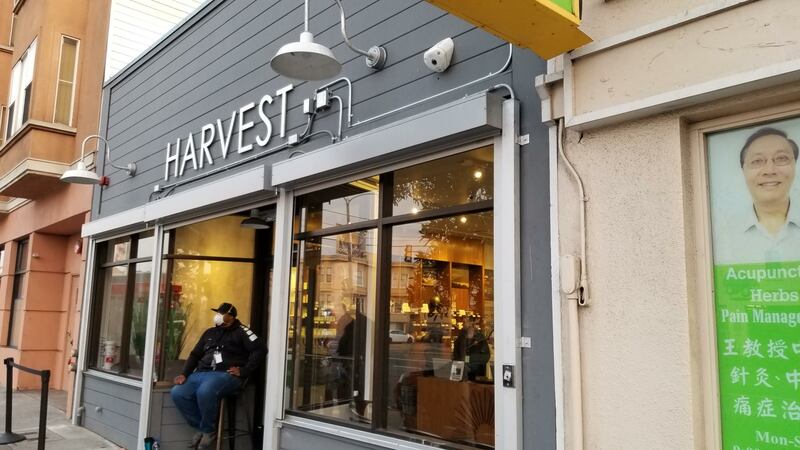 On the other side of town, the Harvest dispensary consumption lounge looks like a stylish living room appealing more to Panera Bread customers than Cheech & Chong aficionados. The wall is lined with benches and throw pillows, and oversized chairs sit on an area rug as jazz plays in the background. Tables and electrical outlets are spread liberally through the room, inviting clients to get some work done while partaking. Their clientele is mostly local, and they charge multi-month memberships that offer both access to the lounge and store credits. They tout promotions like “Monday Night Flowers” and “Dim Sum and Dabs” to draw out the regulars and foster a sense of community. Proprietors say they don’t see how a business like theirs could make money as a standalone consumption lounge without also selling the product on site. Marijuana can already be costly without the addition of a separate cover charge and the logistics of moving from one location to the next. But that’s a problem in Nevada, where the voter-approved 2016 initiative that allowed for recreational sale and use of the drug specifically prohibits individuals from consuming or smoking marijuana inside a retail store (punishable by a misdemeanor and fine up to $600). Lawmakers are prohibited from modifying any voter-approved statutory change for a three-year period, so 2019 will be the first legislative session where a possible change in law could occur. But in the meantime, local government officials including Segerblom are trying to identify ways to permit lounges to operate, such as allowing them to be next door to a dispensary or other workarounds. That raises another issue that San Francisco consumption lounge owners attempted to avoid — customers bringing in their own product. Both lounges policymakers visited required customers first purchase a cannabis product from the attached dispensary, and owners of both said they were concerned that drugs brought in from the outside could have mold or be laced with other substances. San Francisco marijuana businesses face some hurdles not seen in Nevada, such as the California’s 23-year old ban on indoor smoking. City regulators have strict HVAC and air-filtering requirements, necessary to avoid smoke from bothering neighbors in San Francisco’s crowded streets. The city also has a closing time, with many dispensaries shutting down by 10 p.m. instead of staying open around the clock like bars in Las Vegas. Cannabis activity is banned at places that have a liquor license, and cannabis businesses cannot serve food (although the city allows a limited amount of non-perishable food, such as a rack of chips). Marijuana businesses are banned within 600 feet of a school, a youth center or a day care facility — a rule that is so prohibitive in densely packed San Francisco that the city is only applying the law to regular schools. Driving under the influence is one concern Nevada policymakers have about consumption lounges. Regulators say San Francisco’s density and robust public transportation system has largely neutralized the problem there. Nieves-Rivera said the only obvious issue has been first-time users taking a cannabis edible and not being aware of the drug’s delayed effects, but that the city was combatting it through informational sheets. Segerblom said he was encouraged that neither a dispensary nor lounge had reported any major issues with customers buying and consuming on their property, and said he hoped Nevada would adopt a similar flexible regulatory scheme with a more permissive view of how the businesses should operate.